a methodical and retro love letter to one of the most iconic games of all time. Petri Alanko will take you on a spine-twisting warp through reality and back. Eirik will take you on a musical journey through the depths of the world's most dangerous caves. Blood Dragon is a radioactive fuzz for your ears to enjoy! With morality hanging in the balance, will you decide the fate of humanity? With only a neon sword in hand, will you be left trapped inside its grooves before the end? Fallout 4’s soundtrack has all the musings one could hope for in an orchestral view of bombs not long since dropped. A soundtrack born during the height of the 64-bit era, the adventures of this furry bear and squawking bird lives forever in our hearts. Synthetic Core 88 is the catalyst of your wildest dreams! With everything from Jim’s lo-fi folky roots on full display here, it’s no surprise that Planet Coaster has become a classic before it even stops spinning. The pulsating rhythm will course through your veins and draw you deeper into the jaws of demons, with only a shotgun in hand. Ballads of Hyrule is as beautiful a journey as it is hauntingly poetic, and will leave you daydreaming of past and future adventures yet to come your way. This 2xLP has a special price until May 1st. Grab one now to save some money! Crowd funding will last for 30 days. Pledges for this vinyl are open now for $20 and will run for 30 days. Florence is Now Shipping from iam8bit! This limited edition soundtrack to the best mobile game of 2018 by Kevin Penkin is shipping now! Pre-orders open Saturday, April 6th! Pre-orders are available now. Shipping begins in July. LSD Revamped is Available Now from Ship to Shore PhonoCo. This 3 LP set for Osamu Sato’s soundtrack to the cult classic Playstation game LSD Dream Emulator is available to order now! Limited to 250 copies Pocket Rumble is available to pre-order now for $25! On sale now! This 2xLP on “Past and Future” vinyl is limited to 3,000 copies. Silent Hill 1 & 2 Available Now! Limited and Regular Editions Available! Going live at 12pm CST get that F5 button ready! Limited to 1800 numbered copies Anno 1800 is the newest vinyl release by Black Screen Records. Plastered with beautiful artwork from Drew Wise this is one good looking release! Pre-Sale goes live November 23rd at 1pm EST! Into The Breach vinyl is here! Zelda & Chill will be coming to vinyl early next year! Pre-orders for Rozen's ﻿Children of Termina ﻿have opened up for a physical release in 2019.
iam8bit has just opened up orders for the 20th Anniversary of Grim Fandango on 2xLP. Spacelab9 will be releasing a limited 300 run of the Outlast Trilogy on vinyl! The Main Blog Page Has Been Moved! Kick back and relax this week with Zelda & Chill by Mikel and GameChops. Pressed on heavy weight black vinyl by Materia Collective, this lo-fi hip hop tribute to the Zelda universe is a much needed break for your adventurous heart. Another Materia Collective release, another Zelda album. It seems to be a super popular thing to cover in the video game music scene. I can’t really complain -- Zelda has ingrained itself as being a cornerstone franchise, and the work Koji Kondo and Nintendo has achieved is nothing short of amazing. I know some people might be getting tired of how saturated the Zelda arrangement scene has gotten, but for me, the albums are so unique in their own way and a pleasure to listen to. I wouldn’t be hurt to see some other classic game series’ get the same love as Zelda. The more music the better in my opinion. Definitely can’t wait to see what’s next from Mikel! I hope you brought an umbrella this week, because we are taking a stroll through the wonderful sounds of James Primate’s Rain World. Pressed on “Marine Translucent and Violet,” as well as glow-in-the-dark vinyl by Black Screen Records, Rain World has a rich and beautiful story behind its grooves and one that I am happy to share with you all. Sit back, breathe in the fresh rain-soaked air, and take a look as we uncover the nightmare-fueled soundtrack that is Rain World. Man, what a wild week this has been. This has been one of the most in-depth articles I think I have worked on yet here at VGM WAX. I am so happy that I got to talk with James about his inspirations, memories, and experiences while working on Rain World. I am completely and truly grateful to be able to share all of this with you, and I hope you enjoy it as much as I did putting it all together. Thanks James & Kevin for making this a truly special VGM WAX moment for me to share with the world. Here’s something cool! 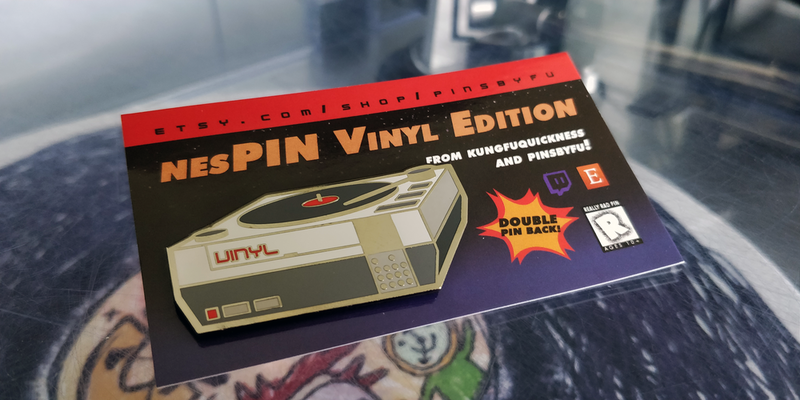 Dane “KungfuQuickness” Baudoin, design wizard over at Black Screen Records and collaborator on Rain World’s packaging, just recently put out a pin on his Etsy to celebrate video game music vinyl. I absolutely love mine, and it has instantly become one of my favorite pins in my collection. Go over to the Etsy page to grab one for yourself and support good art! Back to the pressing plant! Enter a world of blossoming dreams and leave the whole world behind this week with Flower by Vincent Diamante. Pressed on blue marble and white with blue vinyl by iam8bit, this 2xLP soundtrack to thatgamecompany’s 2009 classic is a melodic and peaceful journey that will leave you relaxed in its grooves. This was one that I was pretty excited to cover. I never played this game until I owned a Playstation 4, and boy did I miss out as an Xbox 360 owner. This game and its music is such an experience, one that I think everyone should expose themselves to. I don't think I had ever been enamored by such a pure and simple video game experience before! It completely blew me away. Next week’s forecast calls for showers. Get ready to dive into the darkness this week with Sins of Hyrule by Rozen. Pressed on black vinyl by Materia Collective, this album chronicles the creation and downfall of the glorious Kingdom of Hyrule. Donned in a shroud of gloom, Sins of Hyrule is a retrospective look into the troubled past and future of one of gaming’s most beloved universes. Returning to Rozen’s work after a long hiatus was a fun and exhilarating experience. His Ballads of Hyrule was the second release I covered when I started my website, and was one of my favorite releases from last year. It is wild to look back at this site when it was in its infancy! This sort of feels like a capstone in a way. I have grown a lot from then and continue to write more and fill into this job I love. I certainly can’t wait to see where I will be when I review another Rozen release. I’m sure things will be even better than they are now as this industry continues to grow and flourish. Thank you so much for reading! Hop out of the trenches with a Chainsword and wade into the front lines this week with Warhammer 40,000: Space Marine by Cris Velasco & Sascha Dikiciyan. Pressed on blue and white vinyl by Laced Records, this soundtrack to one of the most chaotic stories in the Warhammer is well worth a listen. Is it worth owning? Let’s find out! This album is definitely one of those that I didn’t expect to ever get released on vinyl. The memories I have playing the multiplayer for this game are ones that I will cherish forever. This game is seriously one of the most underrated games in the entire series and has some great music. If you haven’t checked this game out, I highly recommend it. You can more than likely find it pretty cheap, and if you can find a group to play the multiplayer with I guarantee you will have a great time! Stock up on your mana and launch a few fireballs because this week we are taking an exclusive in-depth look at Jean Chan’s Wizorb. Pressed on red and blue orb picture disc vinyl by Yetee Records, this is one chiptune soundtrack that you don’t want to miss! This soundtrack was an absolute blast to cover. I remember picking this game up as part of the Humble Indie Bundle 6. This was when I was first exposed to the game and it’s soundtrack as it was included with the bundle price. Man, what an experience it was to get such a hidden gem amongst all the other legendary indie games at the time! The thing that stood out to me most about this game was the soundtrack and just how intoxicating it was. I hope you all enjoy the review, and most of all enjoy the music! Break some blocks, save the kingdom! Fall off the log and tumble down the waterfall with me this week as we uncover the journey of a lifetime with Switched On: Secret of Mana by Switched On SNES. This album is the next release in a series of analog arrangement covers of gaming's most beloved soundtracks. Pressed on an array of colors by Subtropic Records, the soundtrack to Secret of Mana has been reborn in a myriad of analogous tones that will take you back to the good old days! Welcome back for another review. This week was a fun one! I absolutely love Secret of Mana and it's soundtrack is something that I have always regarded as one of my favorite from the 16bit era. This recreation of all those classic tunes I remember and love was a fun trip down memory lane. I have recently been playing the remaster on the Playstation 4, and I have to say it is a blast to revisit. I really hope this version gets released on the Switch, or we possibly see a port of the Seiken Densetsu Collection over here in the West. Hit me up on social media and let me know what some of your favorite classic games are! I’ll see you all on the next one. Get ready to INSERT YOUR SOUL this week as we are taking a galloping leap into Pony Island by Jonah Senzel, pressed on clear vinyl by Black Screen Records. This album packs a serious punch so sit back, relax, and let the bits flow over you. Welcome back for another review. This album is really great and honestly one that flew completely under my radar when it came out. If you have not checked this one out, I highly recommend you do. Give the review a read and the album a listen, you won't be disappointed I assure you! I have some crazy things in the works, so keep yourself locked into that groove. If you haven't already, sign up for the First Pressing List so you can stay up to date on a few things coming in the future! Come gather some loot and try a few runs this week with Dead Cells by Yoann Laulan. Pressed on “translucent orange and violet” vinyl by Laced Records, the soundtrack to this indie hit has found a new home on vinyl, and it sounds absolutely incredible! Thank you all for coming back again this week as I take a deeper look into the soundtracks that fill out my collection. I’m still working on some of the backend on the site and hopefully making it easier for you all to browse around and explore the fantastic people who make all of the releases I cover possible. I’ll see you all next week! Don’t forget to clean your stylus! Hop into a new timeline this week with Ben Prunty’s Into the Breach. Pressed on “translucent, smoky green” vinyl by Fangamer this album is a real treat for fans of the game and Ben’s work as a whole. This is one seriously gorgeous release! I have been pouring over a ton of website revisions this past weekend. The reviews are now under a new section of the site labeled “reviews” instead of “blog.” I think this makes way more sense, and is more honest about what I am doing here with this project. A couple other pages on the site have seen some revisions, namely the “Artists” and “Record Label” pages. 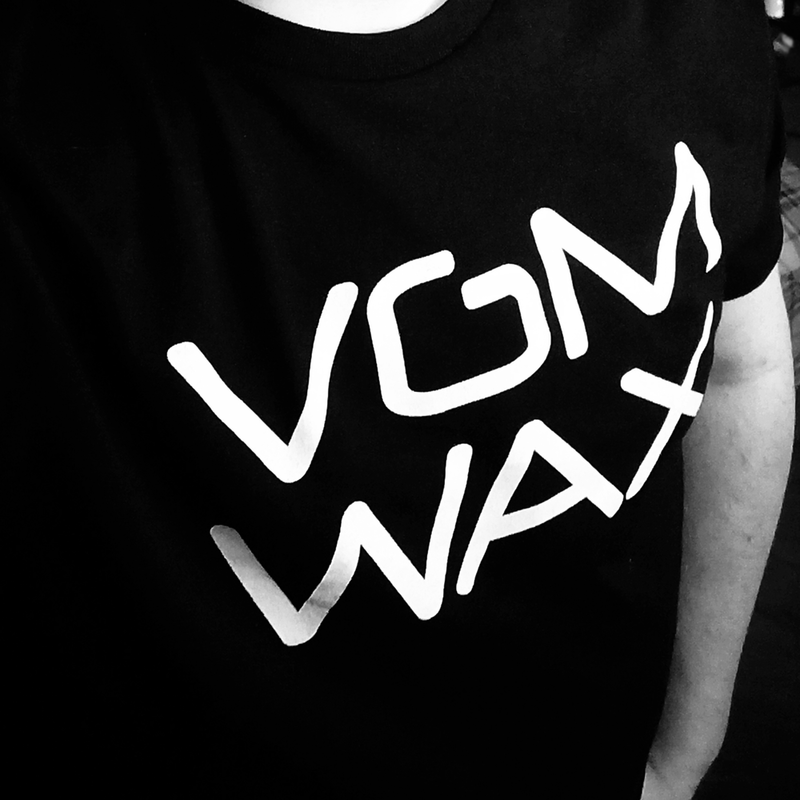 Artists are being updated to have their own pages on VGM WAX, where you can see all of their social media pages and where they have been featured on this site. The same goes for the record labels: they have been overhauled to have their own pages, and they will also start to feature articles from here on the site in their respective sections. I hope that some of these redesigns make the site more user friendly and help the usability for those who wish to explore. Thank you so much for your continued support -- I’ll see you all next week with another review! Sit back and take a couple of turns to conquer the galaxy this week with FlybyNo's soundtrack to Amplitude Studio's 4X strategy game, Endless Space 2. Pressed on stunning transparent blue vinyl by G4F Records, you'll be drifting through space in no time! Blog Post #21 has arrived! Time to party! Thanks for coming back another week to enjoy some awesome music with me. I really enjoyed my time with this one and I know you will too. FlybyNo is one of those composers that never really disappoints, and I am super happy to be able to listen to his stunning arrangements on vinyl! These are super limited, so don't hesitate to support G4F Records and treat yo’ self to a new record! This week we are taking a look at Cosmic Star Heroine Vol. 1 by HyperDuck SoundWorks. Pressed on an array of stunning colors by Ship to Shore PhonoCo., this album to the beloved indie gem will pump you up for whatever battles lie ahead! I decided to go a little overboard with this release and pick up every possible variant I could. I just love this game and the music that inhabits its world. Ship to Shore definitely went above and beyond with these releases, and made them fairly accessible. I am pretty happy with how all of these turned out and each color sounds impeccable on my table! Let’s jump into another 16 bit era tribute this week with Saskrotch’s Zones (Act 1 & 2)! Pressed on “Royal Blue” vinyl by Yetee Records, this album’s fast paced rhythm will keep you grooving from side A to side B. This weeks article is a little different, as I have done a small Q&A session with Saskrotch to lift the lid on what makes this album so special! No relaxing with this one — it’s time to go fast! I decided to change things up a bit and bring some fresh content to the weekly review format. I hope you all enjoy learning a little bit more about the man behind the music on this one. Please don’t hesitate in heading over to Saskrotch’s Bandcamp page and giving him a follow and listen to some great music while you’re there. There’s even a little “Adopt a 'Skrotch” button over there if you feel like supporting him to continue making awesome tunes! Saskrotch even has a Twitch channel if you would prefer to head over there and chat with him while he plays games. Please let me know how you all enjoyed the article this week and don’t forget to give me a follow over on social media! Grab your Super Nintendo controller because this week we are breaking some pots in search of Rupees with Switched On: A Link to The Past by Switched On SNES, pressed on “ultra clear with Transparent Blue in Color with Green and Magenta splatter” by Streaming Arrow Records. This is one arrangement album that you will want to dust off the old cartridge for. Mastered for playback at 45 & 33 ⅓ rpm, get ready to relive your nostalgic dream on one absolutely stunning vinyl! Well here we are — another week, another WAX Wednesday. This was a really fun album to listen to. Whether you are a fan of the Zelda series or not, you owe it to yourself to give this album a listen. The love and dedication here towards Koji’s wonderful arrangements is quite admirable; a lot of love and respect went into this album! Will has given me a few Bandcamp codes to share with all of you, so keep your eyes here on the site and on my various social media pages in order to win a copy. Spread some love to Switched On SNES and give the album a listen today. You won’t regret it! Hop into the Arwing and strap in tight because this week we are barrel rolling into Fortuna: The Sector X Sessions. Pressed on “Corneria Planet" blue and green swirl vinyl by Yetee Records & Materia Collective, we will hear an absolutely incredible roster of indie musicians including Smooth McGroove, Saskrotch, R23X, EQUIP, Slime Girls, and Jackson Alexander Parodi. This tribute to beloved Nintendo title Star Fox is here to blow you away. I have chosen to step down from my full time job to pursue my dream full time — the biggest part of that dream is this website. Get prepped to see a lot more content in the next coming months as I continue to flesh out the remainder of the site. I look forward to seeing where this journey will take me, and I am so happy to be sharing it with each and every one of you who support me every week. Thank you for all that you do and continue striving to be the best version of yourself you can be. I know I will! Back to the pressing plant, Fox! Warp through time this week with Quantum Break by Petri Alanko. Pressed on clear with black splatter vinyl by iam8bit Quantum Break is a musically bone-chilling science fiction journey that stands on its own. Whether you are a fan of the game Remedy Entertainment and Microsoft has put together or not, one thing is for certain Petri Alanko’s musical genius is a superb delight to enjoy! I have got to say, Quantum Break was actually an enjoyable game to me. I remember back in the day when it came out and it received pretty polarizing reviews/reception, but the general consensus was that Remedy missed the mark with this one. Science fiction stories hold a special place in my heart and Quantum Break was just cheesy and B-Grade film-like enough for me to thoroughly enjoy it. I feel like if people where to take a look back at this game and give it a fair shake they’d see the potential and hard work that was put into this uniquely interactive game. With Petri’s score here that’s one less thing you’ll have to worry about not being up to snuff. Seriously the music is great! I’ll catch you all next week! Track in to some grooves! Hold on tightly to your eggplant and dive deep under ground with Spelunky by Eirik Suhrke. 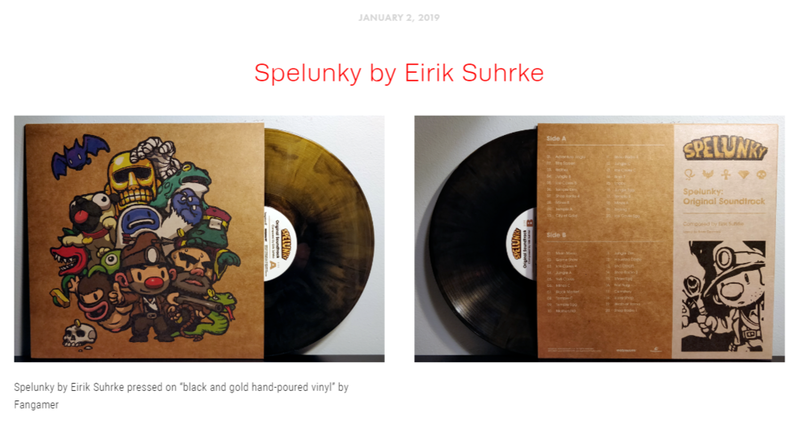 Pressed on “black and gold hand-poured” vinyl by Fangamer, this soundtrack to the revitalized roguelike cave crawler from 2012 is full of jazzy serenades that pull you deeper below the surface. In search for treasure beyond your wildest dreams, will you save the riches or the damsel? Hello and welcome back to your weekly dose of wax. I took a little break at the end of last year from regularly scheduled vinyl postings to bring you the VGM WAX Awards. I hope you had fun taking a look back at some of my favorite releases from last year. I know with the next one, I want to include many more categories and give out a ton of awards. There are just so many amazing people out there that didn’t get recognized, and I want to fill up the prize pool as much as possible. Happy New Year to you all - I hope 2019 is your best year yet. Make the best of everything given to you and strive to become the version of yourself that you want to be. Keep your needles balanced and adjust your anti-skate, because 2019 is going to be amazing! Calibrate your tracking because this week we are taking a look at the cybernetic powerhouse soundtrack to Far Cry 3: Blood Dragon by Power Glove. Pressed on eye-watering neon pink vinyl by Invada Records, the nostalgia driven soundtrack to the 2013 game has gotten a fresh re-press in 2019, and I am here to give you some thoughts! So strap in, because we are going all the way back to 2007 to slay some cyber dragons! Well here we are: another week, another post. I really enjoy this soundtrack a lot and I was always super bummed that I missed out on this one the first time it was pressed. I am very happy that Invada Records re-pressed this incredible soundtrack! I hope you all have a great time this holiday season no matter what you are doing. Be in good company and listen to wonderful music. Share your love with those around you and spread it as far as you can. I will see you all next week! I hope you are ready to climb through some vents and save humanity from the Illuminati because this week we are taking an elevator ride with Deus Ex: Human Revolution by Michael McCann. Pressed by Sumthing Else Music Works on two gorgeous “Golden Smog” vinyl, Human Revolution is without a doubt one of my favorite soundtracks of all time. Get the Neuropozyne and dial in your ears for this one! This past month has been insane for video game vinyl. I feel like every week since the beginning of November we have had a new soundtrack announcement. I am super excited for a lot of these new titles, as well as ones from earlier this year that are starting to get shipped out. It feels like I have had a consistent list of tracking numbers to handle, and all I can say is that I am excited. This year I feel has been absolutely crazy for this industry and I can’t even imagine what 2019 will bring! Meet me at the summit because this week we are covering the soundtrack to Celeste by Lena Raine. Pressed by Ship to Shore PhonoCo. this eclectic and wintry score to one of the best indie games of the past year is here to knock your mittens off! Grab your comfiest throw blanket and snuggle up with your electronic device as we dash right into this weeks post! Hope your brought some strawberries! Tomorrow is The Game Awards, and today’s soundtrack is up for “Best Score/Music”. Be sure to head over to The Game Awards website and cast your votes for this years nominees. Music from Celeste will be performed live at the show, and it is sure to be a blast! Keep an eye on my social media for a chance to win a Bandcamp version of Celeste, provided by Lena herself, to listen to until your hearts content! Fight back the Process and free your soul with Transistor by Darren Korb. Pressed on “Coke-Bottle Clear” vinyl by Supergiant Games & Gotta Groove Records, Transistor is Super Giant Games’ follow up to instant cult classic: Bastion. Take a trip with me to Cloudbank as we explore every dark alley and underbelly slum with a neon blade in hand! This was a truly surprising release for me, and I am so grateful that I was able to snag a copy of this re-press. Darren Korb has always been one of my favorite composers ever since experiencing Bastion with everyone back in 2011. His work has always stuck with me, and the work here on Transistor is, without question, incredible. I want to give a huge shoutout to everyone on the team for signing my copy and for providing extra Bandcamp codes for some of my lucky readers. Please keep an eye on my social media pages — Instagram, Twitter, & Facebook — for a chance to get a digital copy of this incredible soundtrack! Today marks another revolution around the sun for me and a lot has happened this year that makes me feel very grateful to be doing what I love. This has been one of the best years of my life by far; my continued passion and drive pushes me into becoming the best version of myself for those I love, and the industry I care so deeply about. I thank each and every one of you who come and read my thoughts every week. It truly means the world and so much more to me. Thank you for your support and for all your love, I hope to spread as much of my own to you. Let’s continue this journey together and make the best of this ride we possibly can! Grab your Pip-Boy and kick back with a refreshing Nuka-Cola! This week we are taking a look at the soundtrack to Fallout 4 by Inon Zur, pressed on “Vault Suit” blue vinyl by Spacelab9. Containing all 65 incredibly arranged tracks, this deluxe vinyl box set is truly a marvel, despite minor flaws worn beneath the grooves. Climb out of your vault and bring some Rad-X along — we will be hearing the clicks before too long. Happy Launch Day to Fallout 76! I hope many of you are staying safe out in Appalachia today, facing the freshest wasteland we have ever seen in a Fallout game to date. Make sure to stay hydrated, take many breaks, and eat plenty of healthy snacks during your long game sessions. I know I will be right there with you all exploring this brand new world! This week we are traveling at the speed of light with Zanshin's Lightfield soundtrack, pressed on white vinyl by Minimum Records. This is truly one of the prettiest vinyl I have ever seen in terms of packaging and design. If you have yet to give this album a listen, I highly suggest you check out the album on Bandcamp. This one will surely take your table on the ride of its life! Glide your way into this week with a little red breegull in your backpack with Banjo-Kazooie by Grant Kirkhope pressed by iam8bit. This was one of the first video game soundtracks I ever picked up on vinyl. Take a trip back in time with me and relive your nostalgic past with this beloved score to one of Rare’s most cherished games, and one of Nintendo’s most killer games of all time for their N64 system! Gather around the cauldron and let’s all have some brew on this Halloween night! Pop in your cartridge or let your own copy of this beautiful release spin on your table and defeat that wicked witch! Be careful to not get honey on anything! After working almost 24 hours in two days at my job, it was wonderful to sit down and listen to some awesome music and share my thoughts and a fond memory with all of you! Take a moment to reminisce with me about a classic release, one that I’m sure we all hope gets a much needed re-press. Whether you are out with friends tonight or tucked into your homes playing games, I hope you have a wonderfully spooky evening! This weekend I am going to spinning a bit of my collection at my favorite local spot, Club Geek! I want to spread the love of music as far and wide as I possibly can. I hope you all can join with me in supporting all these amazing artists that help make the games we play the best they possibly can be! Venture into the future this week with Equip’s Synthetic Core 88 Soundtrack. A blast from nostalgic past, Synthetic Core 88 sets it’s sights on 90’s nostalgia and takes on a 16-bit era style that will surely knock your socks off. Pressed on “Laser Disc” vinyl by Yetee Records, this is not a release to be missed. Although Synthetic Core 88 isn’t really a game (please someone pick up this idea and make it a thing), let your imagination carry you off into a neo-dystopian RPG adventure to save the future! Thanks for coming back for another weekly dose of WAX! Covering Synthetic Core 88 was a real treat. This is truly one of my favorite releases to come out this year, and I am extremely excited to see what Equip comes up with next. I highly recommend you go through and listen to everything from Equip, Kevin Hein, and Subhumanizer. The talent on display from all of these libraries of music is extraordinary! Stay tuned next week for a spooky Halloween edition of WAX Wednesday! I hope you all have your cotton candy ready this week, because we are taking a screaming descent into the amazing You, Me & Gravity: The Music of Planet Coaster composed by Jim Guthrie & J.J. Ipsen. This wonderful soundtrack will take you on a trip through one of the most magically down to earth theme parks you could ever imagine. Fill your ears with analog grooves and plucky tunes; sit back, relax, and take a ride on the worlds most folky coaster. Pressed on “Day Turns to Night” vinyl by iam8bit, the soundtrack to Planet Coaster is surely a masterpiece that will be loved for years to come! I hope everyone has had a wonderful week. I have got some exciting new vinyl on the way. I’ve been slowly trying to catch up on all the amazing releases over the past year or so. This year is not even over, and I feel like there has been more amazing releases this year than in the past. We are nearing the end of 2018, and it seems like there are many more surprise announcements to come. Keep an eye on my social media pages, and give a follow to all the amazing labels I have linked HERE. Take care, and I will see you all next week for another Blog Post! Welcome back to another weekly groove session. This Wednesday we are going to be talking about the lovely Shadowrun: Hong Kong by Jon Everist. This release was pressed on gold and silver vinyl by Black Screen Records, and was truly a treat to spend some quality time with. The Shadowrun series has always held a special place in my heart, and I hope to share some of my love for this release with you. I highly recommend you spend some quality time not only with this album, but the game if you have a chance. The insane work Harebrained and company have put into reviving this amazing series is not something that should be dismissed. Sit back, relax, and bask in this Eastern dystopian synth-capade. Hopefully when you unplug you’ll remain more than just a vestige of your former self! Stay locked into the groove! A lot of exciting new content will be coming up soon. Thanks so much for continuing to come back week in and week out to follow my passion project. This is truly a delight for me to sit down each week and really focus on a particular release in my library. I hope that you all are having as much fun reading my thoughts as I am with sharing them. None of this could be possible without the incredible support of my family and friends, not to mention the insane work that record labels and artists have put into making this an industry worth supporting. There has been a lot of heartache surrounding bootlegs this week, and I just want to be upfront. I will not be featuring any release that does not directly support those who pour their heart and souls into making the things that enrich our lives so much a reality. Keep on pressing, much love to everyone! Catch you on the flippty flip! This week is a big one! Today I will be covering the exquisite DOOM soundtrack by Mick Gordon pressed on red vinyl by Laced Records. This limited edition box set is easily one of the greatest releases to grace my turntable, and I am so glad to be able to share it with you. So grab your BFG and jump head first into hell! Thanks for stopping by and checking out my website. There are tons of awesome upcoming releases, so keep an eye on my Twitter to see when I retweet announcements. Also, Blip Blop is literally one of the best resources out there for staying up to date on releases as soon as they are announced. I will be working more on the new releases part of my site in the future (there’s a lot of ‘em), but for right now those are the best resources out there! Take care, and I’ll catch you on the B-Side! Welcome back to another weekly dose of wax. Today I am going to be sharing with you the wonderful Ballads of Hyrule composed by Rozen and pressed on limited Milky White vinyl by the wonderful people over at Materia Collective. This was such a treat to experience, and I hope to share some of my excitement with you. Hop on over to the blog post and give it a listen while you read. I know you will be transported to a beautiful adventure just like I was! Thanks for stopping by and checking out this weeks blog post. I have a lot that I am still working on getting up and running here on the site. Please feel free to check out my Instagram, Twitter, and Facebook, where I post regularly and engage with the community. I’d love to see you over there, and look forward to hearing from all of you. Thank you so much to everyone who has been so supportive of this journey; whether you are family, friends, or industry wax heads, please know that you are loved, and I appreciate all of you more than you know. Hey there, my name is Jacob. Thanks for being awesome and visiting my website! I am dedicating this project to my collection and love of video game music vinyl. This will be a space for me to post pictures, share thoughts about releases, and just talk about the medium I love so dearly. So please hang around and take a look. This is a huge work in progress, so there will undoubtedly be more to come in the future. For right now, please feel free to read my first blog post about the wonderful DEADBOLT by Chris Christodoulou, pressed by Black Screen Records, and sign up for my newsletter to be the first to know when I post anything new here. Stay locked into that groove! It is an extreme pleasure for me to write about one of my favorite artists’ pressings from one of my favorite labels. This little journey I am taking is definitely one that I am excited to share with all of you. Please feel free to like, share, or leave a comment about your thoughts on this awesome record. I’d love to hear from you! Back to the pressing plant. Stay tuned for more content!